I have been a Family Learning Commissioner for NIACE (The National Institute of Adult Continuing Education) England and Wales. NIACE is a non-governmental organisation working for adult learners that advocates on behalf of adult learners and providers. Its focus is on those who are least skilled, most disadvantaged and whose motivation, economic and social circumstances present barriers to engaging in learning. The year long Inquiry into Family Learning was launched in October 2012 to gather new evidence of the impact of family learning, to develop new thinking and to influence public policy. 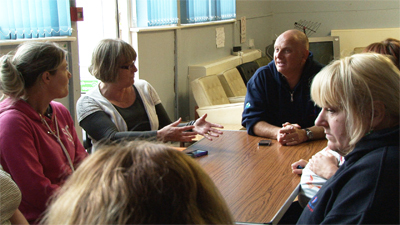 Mair Francis talks with community members at Croescrw Community Learning Centre in June, 2013. Research shows that family learning could increase the overall level of children’s development by as much as 15% for those from disadvantaged groups. Family Learning should be integral to school strategies to raise children’s attainment and to narrow the gap between the lowest and highest achievers. Family Learning should be a key element of adult learning and skills strategies to engage those furthest from the labour market and improve employability, especially through family language and maths provision. Every child should have the right to be part of a learning family. Many children grow up in families that can support family learning but some do not. Targeted support should be available for these families. Key government departments in England and Wales should include family learning in their policies and strategies in order to achieve cross-departmental outcomes. The governments of England and Wales should regularly review the funding for and supply of family learning against potential demand. There should be a joint national forum for family learning in England and Wales to support high quality, innovative practice, appropriate policy and advocacy, research and development. For more detailed information on the recommendations please visit the NIACE website. After Coal project advisor Mair Francis is a community organizer and author of numerous articles on women’s training and lifelong learning, including her history of the DOVE Workshop in Banwen. DOVE is a women’s training center in the Dulais Valley, of which Francis was founder and manager from 1985-1999. She is currently the Senior Parliamentary Assistant for Dr. Hywel Francis, MP.